It comes with a seizure warning. Troye Sivan released the video for his new song "My My My" on Apple Music tonight. The video - which, FYI, comes with a warning that it contains seizure triggers for those with photosensitive epilepsy - is heavy on Troye close-ups and, obviously, flashing lights. 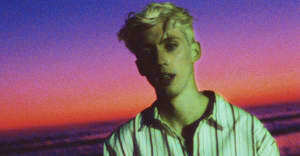 Sivan's last album, Blue Neighborhood, came out in 2015. Last January, he released a video for his song "Heaven," which included archival footage of the historic gay rights protests. Watch the video for "My My My" below. Thumbnail courtesy of Rich Polk/Getty Images for iHeartMedia.